Fire crews were damping down on Tuesday after a major fire ripped through a Victorian stately home in Lincolnshire. 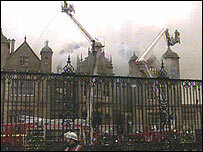 More than 120 firefighters battled the fire in the north wing of Stoke Rochford Hall near Grantham. Teams, including some sent from Leics, had to withdraw from the building as the fire spread over three floors. The building, used as a residential conference and training centre by the National Union of Teachers, was evacuated but no-one was injured. The fire started just before 0900 GMT on Tuesday. Neil Cheyne of Lincolnshire Fire and Rescue said: "We don't get many fires in heritage buildings and they are very difficult to deal with. "We have the national heritage to worry about. "This is a significant fire and we expect there to be extensive damage." Water from the lake in the grounds is being used to try and contain the flames. Designed by the Scottish architect William Burn, the hall was built in the early 1840s and many of the original features had been retained. The hall is set in more than 1,000 acres of grounds.